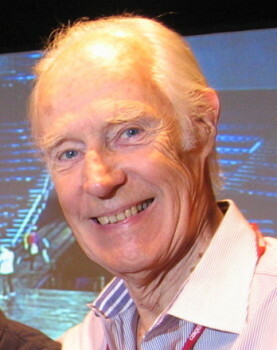 Sir George Martin in Las Vegas for the rehearsals of “LOVE” in June 2006. Photo: Adam Sharp. 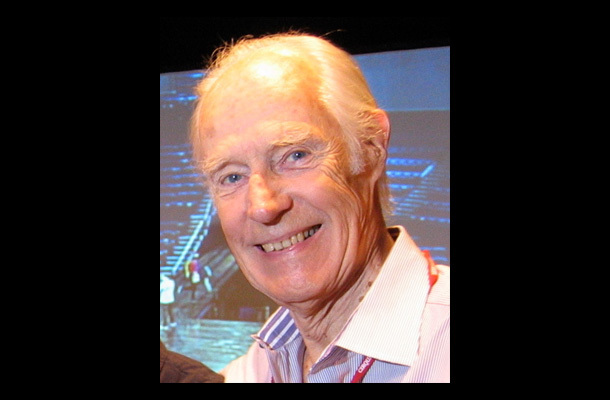 Sir George Martin, the legendary British record producer best-known for his groundbreaking work with The Beatles between 1962-1970, died in London Tuesday night, March 8, 2016, local time. The six-time Grammy winner was 90. News of Sir George’s death “peacefully at home” was announced by Adam Sharp, founder of the management company that represents Martin. Word immediately spread worldwide via social media and news and entertainment websites. Collaborators, fellow producers-engineers, musicians and especially Beatles fans expressed deep regret at his passing, and condolences to Judy, his wife of more than 50 years, their four children and their grandchildren. “The world has lost a truly great man who left an indelible mark on my soul and the history of British music,” Paul McCartney wrote as part of a lengthy post on his Facebook page, using adding the string quartet to “Yesterday” as a prime example of Sir George’s genius, and his willingness to experiment. “When I was mixing Robbie Williams’ ‘Swing While You’re Winning’ in September 2001 in [Sir George’s] AIR Studios in London, George Martin would come by the studio on his way to his office at 9 a.m.,” Schmitt wrote. “He would have his tea and I coffee and we would chat. We did this every day for about 10 days. “He was warm and funny and a true gentleman. I loved this wonderful man and will miss him. He always sent regards from mutual friends. Rest in peace, Sir George, and thanks for all the wonderful music,” Schmitt wrote. As Americans started reading the news Tuesday night, Londoners including Mark Lewisohn, the world-respected Beatles expert, biographer and Sir George collaborator, found out when they awoke for breakfast Wednesday morning. Lewisohn, whose book “The Beatles: All These Years, Vol. 1 − Tune In” was published in the U.S. by Crown in October 2013 and quickly became a New York Times best-seller, had already been fielding nonstop calls from all kinds of media when this reporter contacted him just after midnight Wednesday West Coast time, about 8:30 a.m. London time. Also the author of definitive Beatles studio and concert chronicles (“The Beatles: Recording Sessions” and “The Beatles Live!”), Lewisohn was already taking calls from British radio and TV morning show producers. For the past couple of years, he’s been focused on researching Vol. 2 of “All These Years” and has turned down most interview requests. But not Wednesday, March 9. “It’s an honor to talk about Sir George, it really is,” Lewisohn said. “It’s a funny thing, because you end up being here, there and everywhere when you’re speaking about someone, and you don’t wish to appear to be in any way capitalizing on someone’s death, which I certainly am not doing. Stephen K. Peeples: What made George Martin – Sir George now – the right guy to produce The Beatles? Mark Lewisohn: George Martin was the right man to produce The Beatles because he respected their point of view. They were always strong-willed, strong-minded individuals, and collectively the more so. They needed someone who would actually listen to what it was they wanted and try to enable it in some way on tape. At the same time, their producer had to be someone they respected. It was a beautifully harmonious relationship from very soon after they met, when they really did tune in to one another. From that point on, there was no one better who could have possibly worked with them. Similarly from George’s perspective, there were no better artists for him to work with, because they had this combined, united quest to always look for something new and to move on from whatever they did last time. They were a united fivesome in that respect – a perfect quintet in the studio. Peeples: Absolutely. What do you think was his most important contribution? Not necessarily in terms of a particular track, but overall? Lewisohn: Lewisohn: It’s a hard one to measure. Whatever the producer’s role is, is something they worked out between them. They didn’t need an overbearing producer. They didn’t need a producer who would bring his ego too strongly to the table. They needed someone who would actually facilitate the things they were hoping to achieve. So, that is a massive achievement right there, for Sir George and The Beatles. They [liked] his personality – he was a very nice man to have around. He had a point of view, and as I said, he was always able to listen to others’ point of view. So, he was extremely good company, they thought he was very funny – indeed, he was very funny. It just could not have been better. There were four of them always, The Beatles, and when they closed ranks it would exclude even the likes of George Martin, but undoubtedly when it came to creating music, George Martin was the man that they wanted to do it with. And let’s face it – the body of music that they worked on together is lasting forever. What a legacy that is. Lewisohn: Yeah. Toward the end of The Beatles’ time together, they were toying with the idea of working with other people which is their right as creative people, to try new things. When they did do something without [George], which was the “Get Back”/“Let It Be” project [with producer Glyn Johns in January 1969 and re/over-producer Phil Spector in early 1970], it not only [had] George’s [lessened] involvement, it wasn’t the happiest project. When they decided they would do one last album together, there was only one man they were going to work with, and George Martin got the call, and “Abbey Road” is, of course, yet another triumph. It’s a story of a great many triumphs. Peeples: Most definitely. In terms of his musical performances with the group, my personal favorite is his piano solo for “In My Life.” What do you think was his most important musical contribution to any particular track? There’s a quote of John Lennon saying, “We wanted to go ‘ooh, ooh’ and ‘ee, ee,’” and George is saying, “Look, chaps, I thought of this!” and them saying, “Great, great! Let’s put it on here.” That is exactly a brilliant crystallization from John there, in that [George] came up with ideas they wouldn’t have thought of themselves. But like I keep saying, we must keep this in the retrospective: they came up with things he wouldn’t have thought of. This was a relationship of equals, and that’s why it’s so strong. Peeples: Most definitely. He had a huge legacy outside The Beatles, both before and after. Can you talk a little bit about that? Lewisohn: Yes. I had the privilege of spending a few months back in 2001 putting together a six-CD boxed set of George Martin’s 50-year career, “Produced by George Martin.” Six CDs, 158 tracks. I think there were about three Beatles tracks on there, but the rest of them – a phenomenal range of different musical pieces, from classical symphonies to jazz to light classics to little [operas] to certainly novelty and comedy records, which was what he was becoming known for in the U.K. before The Beatles came along. I hope that today, while George Martin is being remembered for his Beatles, that people also talk about “Goodness Gracious Me” by Peter Sellers and Sophia Loren. That they talk about “Hole in the Ground” by Bernard Cribbins. That they talk about “From Russia with Love” by Matt Monro and “Goldfinger” by Shirley Bassey and “Live or Let Die” from Paul McCartney, of course, the [James] Bond [movie] themes. This man had an extraordinary career working with all of the greats, and one of the last things he ever did was “Candle in the Wind,” [in] tribute to Princess Diana with Elton John, which became the biggest-selling single record of all time. George Martin had a phenomenal career of highs, but he was such a decent man all the way through – such a pleasure to work with. Peeples: Tell me about your personal relationship with him. How much contact did you have with him during that period and [why was he was a pleasure work with]? Lewisohn: George Martin was always a very easy man to work with. He was interested in your opinion, he did want to know what you thought of something, he would take it on-board, and it would ultimately filter into whatever his decision might be. We worked together on “The Beatles: Anthology” with the three double CDs. He produced them, but I was kind of his adviser and assistant on it. It was a great thrill to be at Abbey Roads with him. I worked on a project/TV show with him in 1992, a documentary. And then I did this boxed set of his 50-year career, with his involvement. So, I had many, many personal good times with Sir George. She’s just sitting there waiting for me, and suddenly Sir George – he was like, six-foot-three, comes out with me to say hello to her and to welcome her, if you like, into the fold. That was a very charming thing to do. He was a charming man who had kindness for people and made them feel good. The ultimate role of the producer is to bring out the best in the people who are around you, and that is what he did. Peeples: That’s a perfect segue, because I wanted to go back and talk just a little bit more about their working relationship. EMI and most producers of pop music in Britain at the time were pretty staid. They were compartmentalized, and EMI was not considered a very experimental label. Yet, Martin was, as you said, open to experimenting, and this group walked in that wasn’t going to settle for just anything, and they did make a fantastic creative group. But the idea that he broke the mold as far as his fellow producers was concerned really intrigues me, because at the time he started working with The Beatles, he got a lot of flak from his peers and contemporaries in the engineering and producing world. Lewisohn: He was a maverick, and for a while, just before The Beatles came along, he was the youngest record producer in London. That was crucial, because there was a tendency on the part of his colleagues and contemporaries to be 10, 15, 20 years older, and therefore this was not their kind of music – rock ‘n’ roll. Rock ‘n’ roll wasn’t George’s kind of music either, but he was very cool to the idea of doing different things. Had they been with any other producer who would have imposed his point of view too strongly upon them, then The Beatles would have been hampered in the way that they were working. George Martin never cramped their style. He only ever brought the best out of them. They were incredibly lucky to have a man like that – more lucky than they ever realized, because the story of how George Martin came to sign The Beatles, which I tell in my book, “Tune In,” is one that makes you realize just on what blend of threads their good fortunes all hang, because he didn’t really want to sign them, either. He was persuaded to sign them, hadn’t even met them yet, and only after he had signed them did he realize just what he had in front of him. His ability to only enhance their music and in no way impose himself upon it was vital. Peeples: At the very outset when he signed them, he was a little bit – trying to reshape them a bit. It was he who suggested that they jettison Pete Best, correct? Which is what actually record producers did quite routinely, especially once the groups started to come in – The Beatles opened the floodgates to massive numbers of groups all getting into the recording studio, and many of them were better onstage than they were in the studio, and the flaws onstage were less apparent than they were once you put them down on tape. He was savvy enough to realize that they were a group and that one of them shouldn’t be the leader. Not that they would have expected such a position, anyway, but he didn’t even try. He just recognized that what he saw was what… He saw in them what Brian Epstein saw, which was, “If I make these people available to the public, the public will like them.” And certainly both men – The Beatles were incredibly fortunate to have Brian as their manager and George as their producer, and as I keep saying, they were fortunate to have The Beatles in their lives. We’re talking here really about partnerships. Peeples: Definitely. George did want them to record “How Do You Do It” at the very beginning, too. And I think the way they handled that – they pushed back on that gently, and told him that they were not really interested in doing other people’s stuff, that they were more interested in developing their own art and craft. Lewisohn: They made that point of view clear to George. “We will do this, but we really, really, really would rather you don’t release it.” They had no real position to be making such a request. But the actual truth of the matter, because these things should be looked at from all angles, is that George didn’t really listen to their request so much as the demands of others that it not be issued. … In The Beatles’ eyes, it appeared to them that he had listened to their request to not release it. In fact, there were other reasons why that record did not come out at the time. But all that is nit-picking. The reality is that from the end of 1962 to the middle of 1970, The Beatles had the most brilliant working relationship with this man, and it was a working relationship that extended into personal friendship, as well. He and Judy went on a holiday with John and Cynthia, for example. And they were close – they were actually close to these two. They respected one another that much. Peeples: That’s a perfect way to wrap it up. How’s Volume 2 coming? Lewisohn: (laughs) Volume 2 is coming along fine, thank you. There’s such a lot to do on it. The project just gets bigger and bigger. It’s coming along well. I’m researching constantly, finding great material constantly. I can’t wait to sit and write it and can’t wait for people to read it, but it will take a while. Peeples: Very good. Thank you so much, Mark, for your time. I appreciate it. Any parting shots? Lewisohn: George was a one-of-a-kind and a gentleman and a scholar. He was brilliant at what he did. He was the enabler of The Beatles’ talented flower and development in the recording studio. He was not the “fifth Beatle,” I don’t buy into any of this “fifth Beatle” stuff, but undoubtedly in the studio they were five, and he was the fifth guy. Photos: Lewisohn and Peeples by Nadine A. Peeples. Special thanks to A. Paige Hagen for the transcription. Santa Clarita journalist Stephen K. Peeples was the original, award-winning producer of “The Lost Lennon Tapes” radio series for the Westwood One Radio Network from 1988-1990. 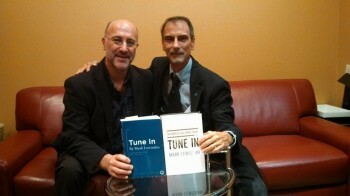 Mark Lewisohn was Peeples’ invaluable Research Consultant. Peeples, a Grammy-nominated record producer (“Monterey International Pop Festival,” MIPF/Rhino, 1992), is a veteran record industry media relations executive (Capitol Records, Elektra/Asylum Records, Westwood One, Rhino Entertainment, 1977-1998) and website content manager (Warner New Media, 1998-2001). Opting to work closer to home, he was music and entertainment features writer and columnist for the Santa Clarita Valley Signal (2004-2011), and soon became an award-winning online editor (The Signal website, 2007-2011). Now retired, Peeples was most recently Vice President/New Media & Editorial with Los Angeles-based multimedia pop culture company Rare Cool Stuff Unltd. He also wrote features for Santa Clarita’s KHTS-AM 1220 News (www.hometownstation.com) and SCVNews.com. And he hosted, wrote and co-produced the WAVE-nominated “House Blend” music and interview television show on SCVTV, community television for the Santa Clarita Valley. For more information, email skp (at) stephenkpeeples.com or visit http://www.stephenkpeeples.com.